Konica Minolta Business Technologies, Inc. has announced the updated version of the PageScope Mobile application for Apple mobile devices to work with the Bizhub range of Konica Minolta MFPs connected to the same wireless network. PageScope Mobile provides an easy means to print emails and several document formats (pdf, tiff, jp(e)g and xps) on a Bizhub from most iPhones, iPads or iPods. 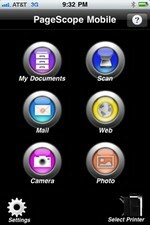 Paper documents can be scanned directly to these mobile devices too. This new version of PageScope Mobile, whilst exclusively for Apple mobile devices, does offer a more secure printing environment for this kind of user (they are identified on the MFP), and thus makes it easier to track and manage their print volumes. Other new features include support for the printing of Google docs and html email, for encrypted pdf files and the extraction of zip files. This app can also be connected with Google Docs. This means documents stored up there can easily be downloaded and printed, and also that Bizhub scan output saved to compatible Apple mobile devices can be uploaded easily too.